A team of professional staff operate an individual person centred approach, giving just the right level of support and personal care to enable each individual to engage fully in their Pathways to Adulthood Programme. Aimed at 16-24 year olds with learning disabilities who are making the transition from school into adult lives, this programme operates with high levels of support staff. The standard ratio of teachers & learning support assistants to clients on the the Pathways Programme is 1:3. However, we also provide 1:2 or 1:1 support should this be considered necessary. There are qualified nurses at Midstream . 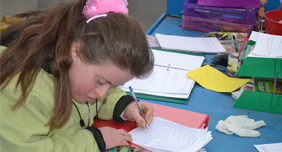 Care support staff specialise in supporting people with learning disabilities, even those whose needs are complex. Some may need specialist interventions such as epilepsy management and require epilepsy rescue medication. Some may have toileting needs. Others may be dependant upon prescribed medications, all of which can be supported at Midstream. All our staff engage with clients to encourage health, well being and healthy eating and to promote inclusion & social interaction. A team of support staff assist at lunch & break times. They help clients make healthy eating choices, assist if clients need help with eating & drinking and help them settle in by making new friends. Our accommodation is modern and purpose built. All buildings and work areas are accessible to people with disabilities. Built on a six and a half acre site our environment is calm and peaceful with landscaped grounds, flower beds, picnic areas, nature trails and a natural stream. Our site is a safe, pleasant place to be, where help is always at hand. Door to door transport can be arranged, subject to funding and availability.